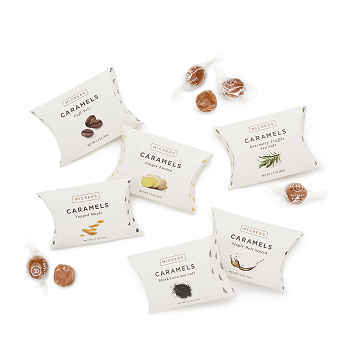 Kate and Jason McCrea use natural ingredients to make their caramels in traditional and unexpected flavors. Kate and Jason McCrea slow cook their luxe, buttery caramel candy in copper kettles, using just a handful of natural ingredients to create distinct, clean flavors. Keeping it local whenever possible, they source organic maple syrup from New Hampshire, sea salt from Maine, and cream from a nearby Massachusetts dairy. Some ingredients travel further—black sea salt from Hawaii, smoky Ardmore whisky from Scotland. This set of six flavors—like rosemary truffle sea salt and tapped maple—has five pieces per package. Give them to your hostess so everyone can choose their favorite. Handmade in Massachusetts. Scientists by trade, Kate and Jason McCrea met on a research trip in Alaska. In 2009, Jason was laid off from his job, and to keep busy, started making caramel from some family recipes. He shared them with friends and neighbors. They all said that it was so good, he should start a business. So, joined by Kate, he did. Their quest is to make the world’s best caramel, by hand, in the US. That’s their story—and they’re sticking to it.